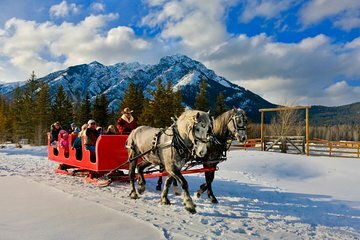 Llegue por su cuenta a Warner Stables en Banff para su paseo en trineo a través de las Montañas Rocosas canadienses. Suba al tradicional trineo tirado por caballos con su grupo y acomódese bajo unas mantas de lana. Vea el vapor del aliento de los caballos elevarse como nubes mientras sale hacia el paisaje cubierto de nieve. Deslícese por praderas inmaculadas durante 45 minutos mientras admira las impresionantes vistas de las montañas y el valle circundante. Observe la fauna y flora local y saque fotos mientras viaja. Very well organised despite the fact that on Christmas Day the temperature was heading towards minus 28 degrees celsius. Beautiful landscape, very good tour guide and necessary resources blanket and warm drinks were also readily available. It was a nice ride but the weather was VERY COLD. -36 degrees . way too cold. But the staff was very accommodating and tried to keep us warm on the ride. Would do again but not in such cold weather. Very knowledge tour guide and driver. We learned a lot of history of the national park and its wild life. Recommend to people who may enjoy learning the history and local wildlife. Not highly recommend for children the ride is semi-fun, as it went through a small area in circle. Good picture opp with the sleigh before and after the tour. We were so fortunate to have the sleigh ride because there had been a big fall of snow that night to make it possible. we had the private sleigh ride for 2 Kate was our driver and Bart was the engine both were fantastic, Kate was knowledgeable if we asked a question otherwise respected our personal space. beautiful backdrop of the mountains and historical buildings on the property, just a wonderful experience offered by real genuine people. I enjoyed it but 45 minutes would have been better than 30 minutes. Excellent trip. Our driver (and horse) was great, the scenery was amazing and the service with top notch. We had a lovely time on our sleigh ride it was fun and would do it again, wear warm clothes.